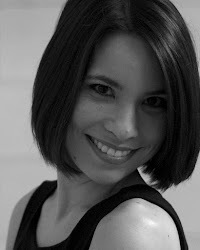 I've taken a bit of a baking/blogging break in the last couple of weeks to get myself settled in for a productive 2012. 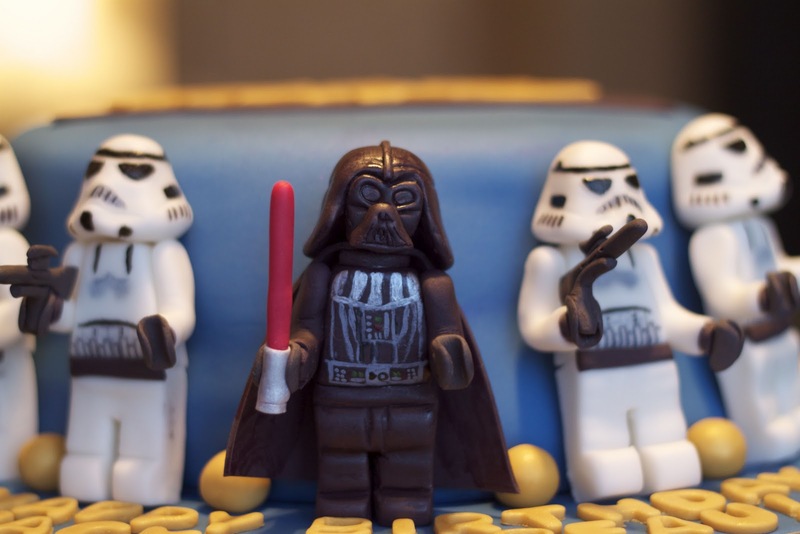 What better way to get back in the swing of things than a Star Wars Lego cake. 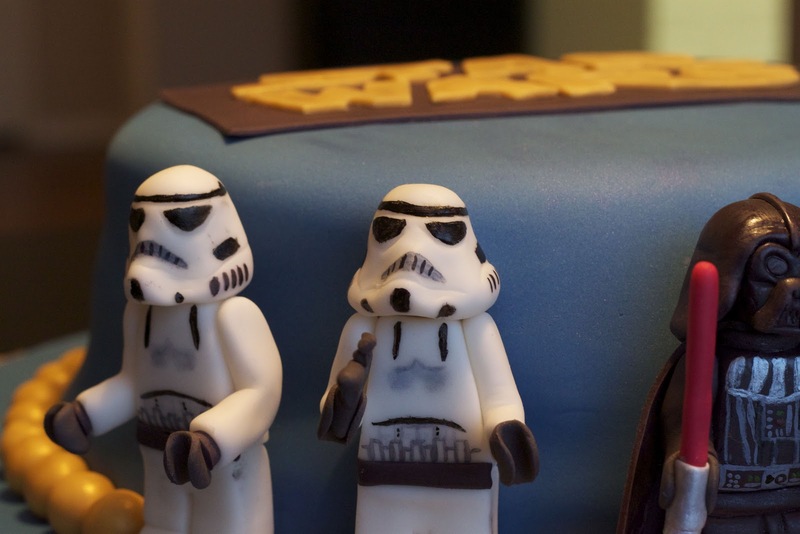 This Star Wars cake - the dark side of the Force - had me singing Darth Vader's tune all week long. For added inspiration I had to revisit Volkswagen's 2011 Superbowl commercial and their more recent 2012 Superbowl teaser both of which put me in a great mood for creating and further cemented Darth's theme in my head. The cake had a few challenges along the way but I was happy with the overall result. My first order of business was creating Darth Vader as I anticipated the helmet might present a challenge. Do I create the face and then put a helmet around the face or do I created his head using one piece of fondant? My first attempt consisted of creating the face and then I tried to shape a helmet around his face. The result was not great. I decided to sleep on it and see if I could come up with another plan. My second attempt involved shaping the head to include the helmet and then I carefully used an X-acto knife to cut the helmet away from the face. Success! I allowed the body with cape to set for a day before attaching the head and waited another day before attaching the arms to make sure everything was secure. I made him shiny by painting him with piping gel mixed with a small amount of vodka. The details are painted on using both a silver glaze and powdered food colouring mixed with vodka. Next were the Stormtroopers. Similar to Darth Vader, I made the bodies first and allowed them to dry before making and adhering the heads. The heads were shaped from one piece of modelling paste and details were painted on with colouring mixed with vodka as well as edible marker. It was challenging to paint small black details on white fondant and not get it all over the place. I learned that little smudges could be fixed with a little brush of vodka. I allowed the heads to dry for about a day and a half before attaching them to the bodies. The hands and the weapons were made using gum paste as it dries harder and faster meaning less chance for breakage. The cake was chocolate devil's food cake with vanilla frosting. Now comes the real challenge of the cake. You may remember my Superman cake post from November in which I fought with a giant air bubble. I attributed this to perhaps missing a spot when moistening the cake. Some people attribute the development of giant air bubbles to a rapid change in temperature after covering a refrigerated cake and that this can be avoided by allowing your cake to come to room temperature before covering it. I must say that I thoroughly chill my swiss meringue buttercream-covered cakes prior to covering in fondant and this has never happened as a result of the refrigeration. Some say that frosting is not stable enough for fondant-covered cakes although I cannot find a good explanation as to why. Perhaps they are right but some people just prefer the taste of frosting. I think you can gather from this paragraph that the giant air bubble or rather bubbles reared their ugly bulges with this cake. If I learned anything from the Superman cake, it was to leave it be as the more you fuss with it, the bigger they seem to grow and the fondant may start to crack in places. 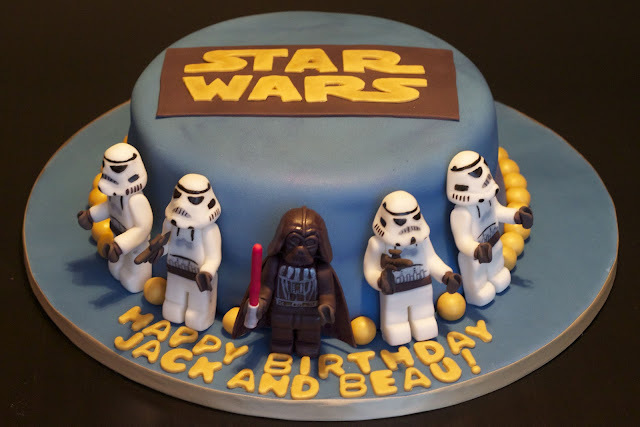 It created somewhat of a Jabba the Hut shape to the sides of the cake which for the most part was thankfully covered by the figurines. My other problem with covering this cake was perhaps the brand of fondant. The fondant I use tends to be on the softer side which means that it may be prone to stretching after you've rolled it out. 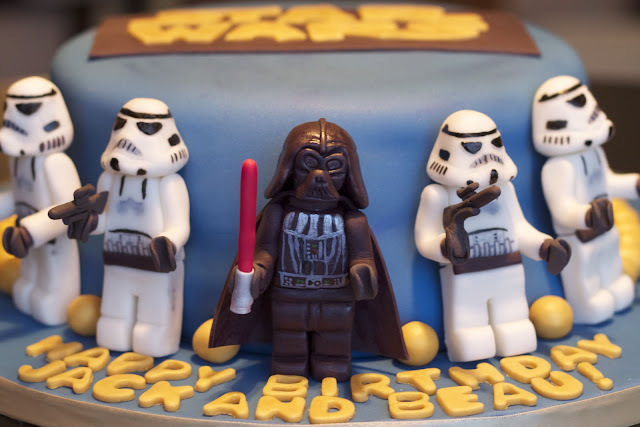 This has not caused too many issues in the past, however in making a dark coloured fondant, you have to add quite a bit of gel paste colouring and this may soften your fondant further. I always weigh and colour my fondant a few days in advance to allow the colour to set and usually the fondant firms up again. I found that this time, the fondant was just too soft and I think this may also have caused problems with getting a smooth finish around the cake as I had to repeatedly re-trim the bottom of the cake. I believe that I am going to be giving another brand a try for covering cakes but may still use my current brand for figure modelling since it still works quite well when mixed with a little Tylose powder. If after switching brands, I continue to experience these frustrations with frosting-covered cakes, I may use frosting only as a filling and continue to mask and crumb coat my cakes with buttercream - it's safer for the cake and my sanity. May the frosting be with you. Love the darth vader details!